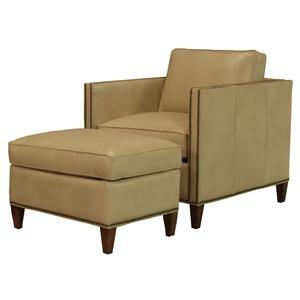 Settle in for a night of television, movies or lounging with this contemporary style chair and ottoman combination. The sophisticated and contemporary chair will give your living room that stylish look you are looking for. The plush box seat and back cushion not only add comfort, but they enhance the modern feel of your room with its clean, crisp lines and welt-cord detail. 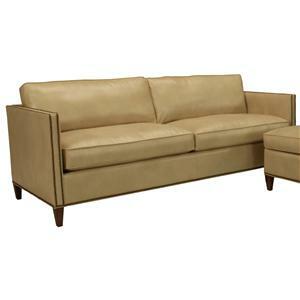 Modern characteristics are also seen in the straight lines of the track arms and tapered block legs. 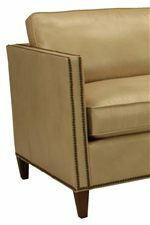 An option for nailhead trim also adds a touch of style and interest. 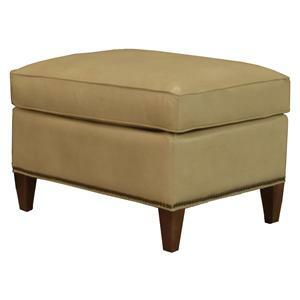 Complementing the chair is an ottoman that features a plush, box shaped cushion with clean lines and welt-cord lining around the edges. Supporting the seat are tapered block legs that are available in different wood finishes. With such a refined and chic design, this chair and ottoman partnership will blend in beautifully with your home decor and provide the ultimate lounging experience. 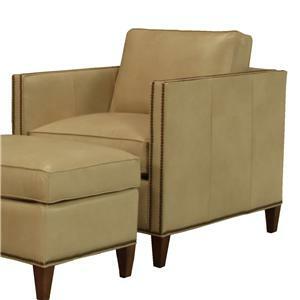 The 1059 Upholstered Chair and Ottoman with Tapered Legs by McCreary Modern is available in the area from BigFurnitureWebsite. 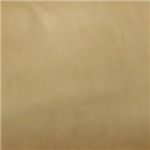 1059-CALB Upholstered Chair 1 33" 37" 35"
1059-OALB Upholstered Ottoman 1 28" 21" 18"